Iowa Wrongful Death of Unborn Children | Hupy and Abraham, S.C.
Can I sue for the death of my unborn child after an Iowa accident results in their death? You have suffered a tragic loss and Iowa law allows you to recover damages for the loss of your child during pregnancy. However, the rules for recovering damages after the loss of an unborn child are not the same as they are for other people, and it is important to understand your rights so that you can take the right actions within the required time to protect you rights. In Iowa, the wrongful death law only applies if your child lived outside of the womb. Thus, if your child was born early because of an accident and your child survived birth, then you may be able to recover damages in a wrongful death action. However, this doesn’t always happen after an accident. Instead, your pregnancy may not have been far enough along for your child to survive, or your child may have suffered fatal injuries in utero that prevented his survival outside of the womb. If your child did not survive birth, then an estate cannot be established for your child, and therefore, a wrongful death case cannot be brought. As a parent, you may still have the right to recover even if your child did not survive the accident. Iowa Rule of Civil Procedure 8 allows parents to recover for the loss of child, rather than the child’s estate to recover for the loss of the child. A parent may recover for actual expenses and for the loss of society and companionship that come from losing a child. Your loss is unique, and so too is your recovery. 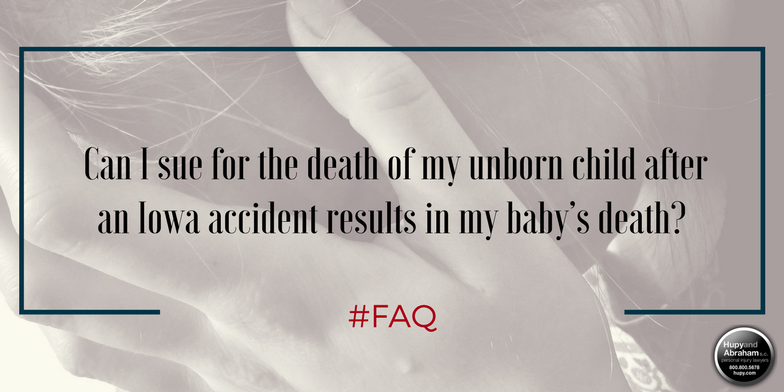 Accordingly, it is important to understand how a wrongful death claim works and how to protect your rights after the loss of an unborn child due to someone else’s negligence. Let our experienced and empathetic attorneys help you during this difficult time. Simply reach out to us any time—24/7/365—via this website or by phone to schedule your free consultation. Posted on 04/03/2017 What Kinds of Accidents Result in Iowa Wrongful Death Lawsuits?